As a not-for-profit organization, volunteers mean everything to the Edmonton and Area Land Trust. They are EALT’s lifeblood. From installing bat boxes to running information booths and everything in-between, our volunteers are dedicated and hardworking. For our 10th Anniversary, we wanted to say an extra special thank you to all the volunteers who dedicated their time and energy to EALT, not only in this past year, but in the last 10 years! We are humbled by your commitment to local nature conservation, and truly grateful to have so many helping hands. Our volunteer team has grown from a small group of interested individuals, to a very large and dedicated engaged community that is doing great things. To say thank you, EALT held a Volunteer Appreciation Event at Bunchberry Meadows Conservation Land in late August. 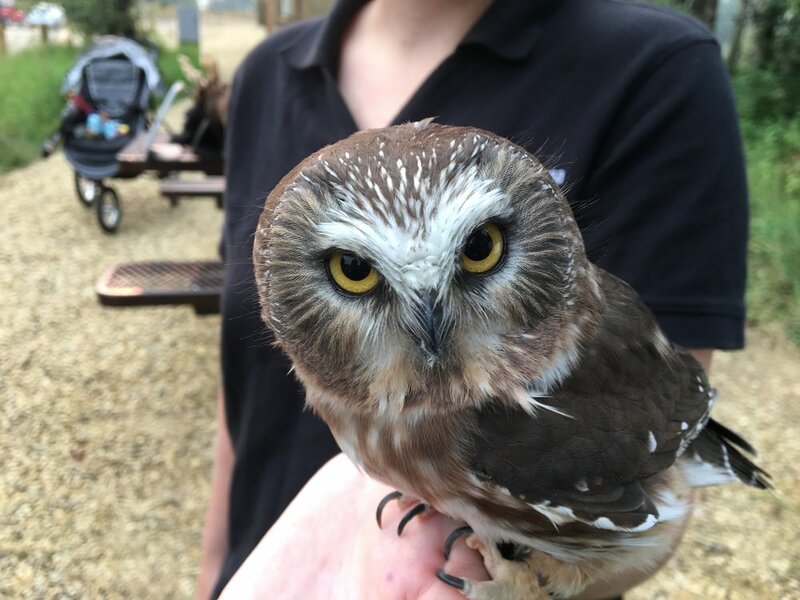 Food, prizes, and fellowship made for a wonderful evening, and with a special visit from Ricki the Northern Saw-whet Owl. Don’t be intimidated by her large piercing eyes. She loves to be petted! Thank you to Beaverhill Bird Observatory for bringing her to our event, and to our sponsors for donating gifts for volunteers. Despite the looming weather, we led a group of volunteers on a nature walk to close out the evening. From the peaceful birch forest and delicious berry taste-testing, to the lightning-struck tree and the owl family calling out together, the walk was incredible! Thank you to the amazing individuals who volunteered with EALT this year. Though summer is over, our work is never finished! Keep watching for our monthly volunteer newsletter to see how you can contribute.